The 26-year-old New Jersey-born man identified by law enforcement sources as the man who opened fire at Fort Lauderale Airport, killing 5 people, had served for years in the National Guard and was recently treated in Alaska after "something got to him," family members said. 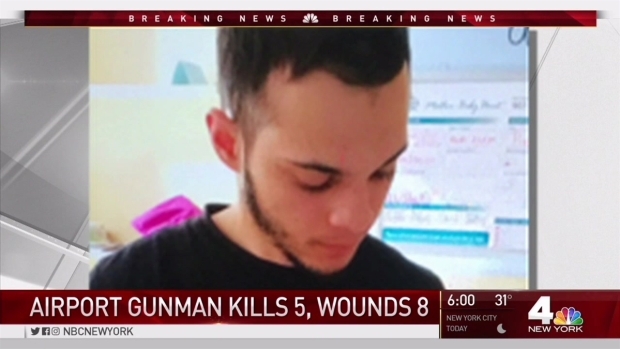 Federal sources told NBC News the shootings did not appear to be an act of terrorism, and that the gunman, identified as Esteban Santiago, appears to have acted alone. While the motive remains under investigation, both federal and family sources said Santiago had some mental health issues. 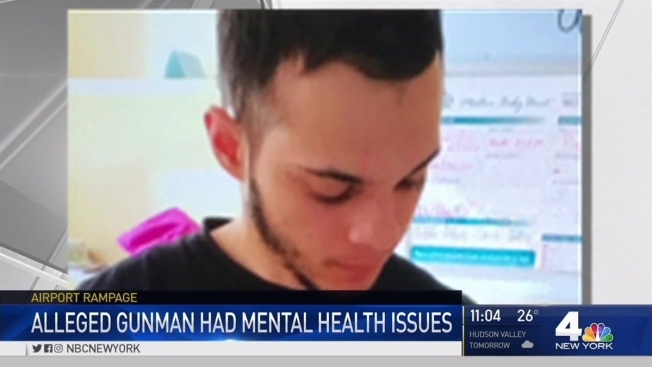 Federal law enforcement officials told NBC News that Santiago was undergoing treatment for mental health problems, complaining that he was hearing voices. We have new details about the man accused of killing five people in a Florida airport. Jonathan Dienst Reports. They say last November, he walked into the FBI's office in Anchorage, Alaska, claiming that his mind was being controlled by the CIA and that it was forcing him to join ISIS. He appeared agitated and incoherent, and made disjointed statements -- and although he said he didn't wish to hurt anyone, agents were concerned by his erratic behavior and decided to call local authorities, a senior federal law enforcement official said. Local police took him to a local medical facility for evaulation, and the FBI closed its assessment of Santiago after conducting database reviews, interagency checks and interviews with family members, the official said. Officials say that on Thursday night, Santiago took Delta Flight 1088 from Anchorage to Minneapolis-St. Paul. He landed Friday morning, and then took Delta Flight 2182 from Minneapolis-St. Paul to Fort Lauderdale. A firearm was his only piece of checked luggage, said Jesse Davis, chief of police at Ted Stevens Anchorage International Airport. A senior federal law enforcement official told NBC 4 New York that Santiago made several other air reservations around the same time he booked the one-way ticket from Alaska through Minneapolis to Florida -- including one that would have departed Alaska on New Year's Eve to go to San Juan, Puerto Rico, with a stop-over in New York City. But he never wound up purchasing those tickets, and as the official pointed out, his checked bag would have gone on to Puerto Rico. After arriving at Fort Lauderdale, he picked up his gun at baggage claim in the airport's Terminal 2 and began firing, sources said. He was taken into custody unharmed. Santiago had military ID on him when he was arrested, multiple senior law enforcement sources told NBC. Suspected Fort Lauderdale airport gunman Esteban Santiago, who was born in New Jersey, still has relatives living in the state. His aunt tells NBC 4 New York sister station Telemundo-47 of his recent activity. Santiago's brother, Bryan Santiago, spoke with NBC News over the phone from Puerto Rico Friday afternoon. He said Esteban was born in March 1990 in New Jersey but moved to Penuela, Puerto Rico, where Bryan and their mother still live. Esteban served in the National Guard in Puerto Rico for six years, and went to Iraq for about a year, Bryan said. "He was pro-America," Bryan said. Esteban has five siblings and he's the youngest, according to Santiago's aunt, Maria Luisa Ruiz, who spoke to NBC 4 sister station Telemundo-47 from her Union City home in New Jersey Friday evening. Two of Esteban's siblings are in Florida and another two are in Puerto Rico, Ruiz said. One of his brothers, who was in Naples on vacation at the time of the shooting, had been a police officer in Puerto Rico for about 20 years. Ruiz said she was able to reach him quickly over the phone on Friday. "He is in a state of desperation," Ruiz said of the brother in Naples. "We've been trying to communicate with what we have back and forth, and he said, 'Ti-ti, I will call you at night because I think I may need to go over there." Mugshot of Fort Lauderdale shooting suspect Esteban Santiago. Ruiz said that Esteban's father died while he was in Iraq. When he returned to Puerto Rico, he studied but struggled to find a job. He then moved to Alaska for work opportunities. "I know that right now he was working in security [in Alaska]," she said in Spanish. "But about two months ago, he was in the hospital." "Something got to him," she said. "It looks like he lost his mind. He would say that he would see things. I don't know. So he went to the hospital. That's what I know. That's what the mother told me, who lives in Puerto Rico." The aunt -- the sister of Esteban's mother -- said Esteban was in the hospital for about two weeks. "Before that, he met a girl. He has a recently born baby with her," she said, adding the baby was born in September, and that's when she last heard from him. "I talked to him after the baby was born. Everything was fine. He was happy with his baby," she said. "He sent me a photo and then I didn't hear anything more." A photo provided by a witness shows the possible suspect in the Fort Lauderdale Airport shooting in custody. Ruiz last saw her nephew in person years ago, when he visited New Jersey for a week upon returning from Iraq. "My entire family is in shock," she said, calling him " a good kid." 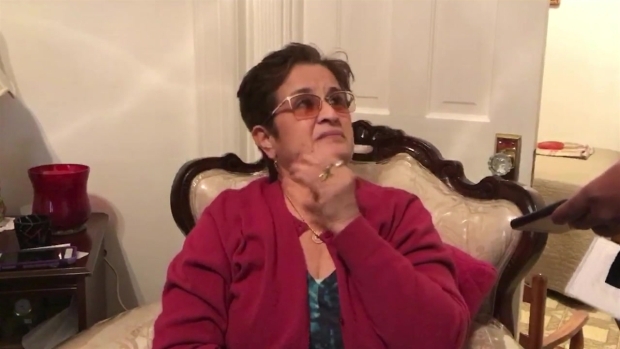 During Telemundo-47's interview with Santiago's aunt, federal officials showed up at the home and ordered everyone to leave. Bryan Santinago told NBC News that Esteban was "fighting with a lot of people" during his time in Alaska, saying he was having relationship issues and arguing with his girlfriend and others. The girlfriend told Bryan that his brother was "receiving psychological counseling in Anchorage." Esteban did have a handgun, his brother said. Bryan said he could not imagine his brother committing the crime, and speculated that perhaps he had a "flashback" from his military experience, although he said there was no PTSD diagnosis or other post-Iraq issues. Raw footage shows people hiding in fear behind a car after five people were shot dead at Fort Lauderdale Airport. Bryan said he had not heard from Esteban for several weeks, which is unusual, and that the family was worried about him. "He is a regular person, spiritual, a good person," he said. A spokeswoman for the Alaska National Guard confirmed to NBC News that Esteban Santiago joined the Puerto Rico National Guard on Dec. 14, 2007, and was deployed to Iraq from April 23, 2010 to Feb. 19, 2011. He was then in the Army Reserves before joining the Alaska Army National Guard on Nov. 21, 2014. He received a general discharge from the Alaska Army National Guard on Aug. 16, 2016, for unsatisfactory performance, the spokeswoman said. Esteban Santiago was a combat engineer and his rank was private first class when he was discharged. Alaskan court records show an Esteban Santiago with the same date of birth was charged with two misdemeanors last year; one count was dismissed and Santiago was due back in court on the second this coming March. Passengers were seen running across the tarmac at Fort Lauderdale / Hollywood International Airport during an active shooter situation that saw five people shot dead. 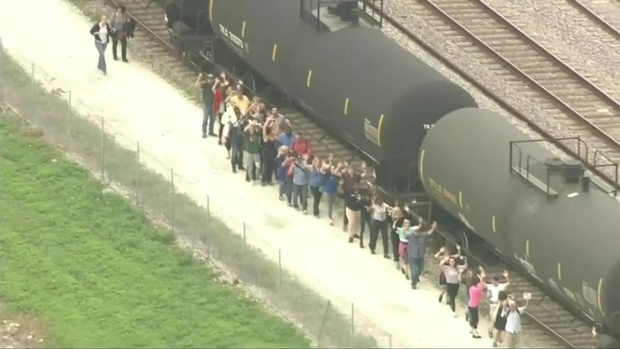 The Broward Sheriff's Office said they received a call about the shooting around 12:55 p.m. Live video more than an hour after the attack showed people running across the tarmac between terminals while others took cover behind car. President-elect Donald Trump tweeted, "Monitoring the terrible situation in Florida. Just spoke to Governor Scott. Thoughts and prayers for all. Stay safe!" Florida Gov. Rick Scott was traveling to Fort Lauderdale to be briefed by law enforcement, his office said.